R. Kunze, H. Saedler, and W.-E. Linnig, Plant Transposable Elements. J.A. Raven, Inorganic Carbon Acquisition by Marine Autotrophs. D. Boulter and R.R.D. Croy, The Structure and Biosynthesis of Legume Seed Storage Proteins: A Biological Solution to the Storage of Nitrogen Seeds. T. Larkum and C.J. Howe, Molecular Aspects of Light Harvesting Processes in Algae. Subject Index. 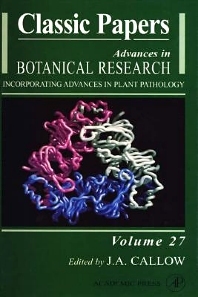 Articles in this Classic Papers volume are rewritten, up-dated and extended versions of papers published in previous volumes of Advances in Botanical Research, chosen because of the high citation of the original papers and the increase of knowledge in the field today. Boulter and Croy discuss the structure and biosynthesis of legume seed storage proteins, an area that has been revolutionized in recent years by advances in 3-D structural analysis and methods of gene manipulation. Raven writes about the significant progress made in our understanding of the biochemistry of inorganic carbon acquisition by marine autotrophs, and places this new information in evolutionary and biogeochemical contexts. Advances in biochemistry have also made impact on research into cyanotixons. Carmichael considers the expansion of cyanotoxin research in the light of the negative impact of these toxins on water quality and aquaculture industries. The structure and regulation of algal photosystems are discussed by Larkum and Howe. They write about the diversity of algal photochemical apparatus and light-harvesting strategy, which has only been appreciated with the use of molecular genetic approaches. Finally, Kunze, Saedler and Loonig review advances in the field of plant transposable elements and the mechanism of transposition. They cover the role of transposable elements in evolution and their use as molecular tools, the importance of which has only speculated on in the original paper in 1986. Postgraduates and researchers in the plant sciences including botany and plant pathology.